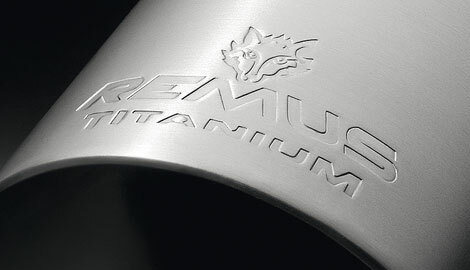 The shot-blasted REMUS Titanium2 system convinces with sophisticated surface treatment and offers an exclusive appearance matched with increased performance and the reduced weight benefit of titanium. Consistent lightweight construction taken directly from REMUS racing exhaust systems, as well as specific geometries and tailored internals which are matched to the engine specifications, leads to a high end exhaust system for inspiring sport oriented drivers. During the development process, numerous parameters such as backpressure, flow- and vibration-characteristics but also thermal and mechanical stress factors were all important factors in the extensive research and development project carried out by the REMUS Engineering Team. Due to utilising the latest technologies and many years of know how and experience in development and production, REMUS is able to offer sportexhaust systems developed for motor sport, adapted for legal road usage. Selected REMUS Titanium2 systems are available with EC-homologation and therefore fulfil the requirements of road traffic regulations.